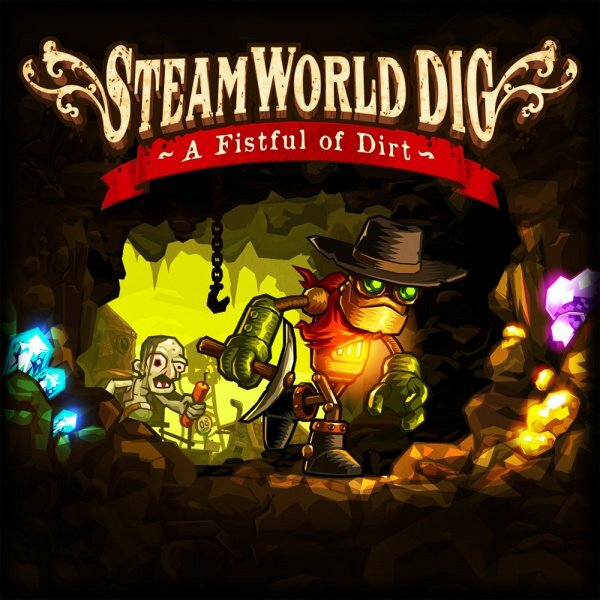 SteamWorld Dig hardly needs any introduction; Image & Form’s 2013 Metroidvania-platformer has cemented itself as part of a much beloved series of games that brightly shine with polish and pedigree. 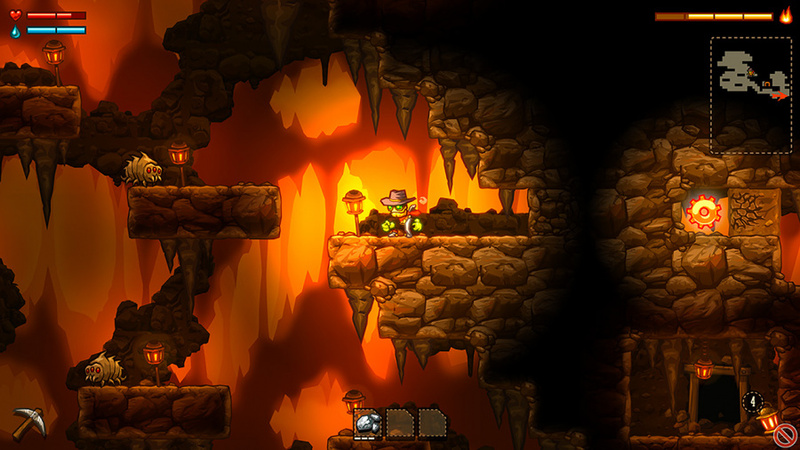 With SteamWorld Dig 2 recently strutting its stuff on Switch, it makes a lot of sense that the developer has decided to bring the original title to the console too, allowing anyone who may have missed the adventure the first time around to experience where Rusty’s platforming endeavours began. This is the exact game we’ve already come to know and love; no extra modes, features, or the like have been added to the game since we last saw it a few years back. The game sets the scene immediately, thrusting you (as Rusty) into the charming town of Tumbleton to claim your uncle’s old goldmine. After finding your uncle’s body, nonchalantly stealing his pickaxe, and then forgetting about the ordeal with about as much empathy as a lion tearing into a defenceless gazelle, you’ll head off to explore the mine for the very first time. 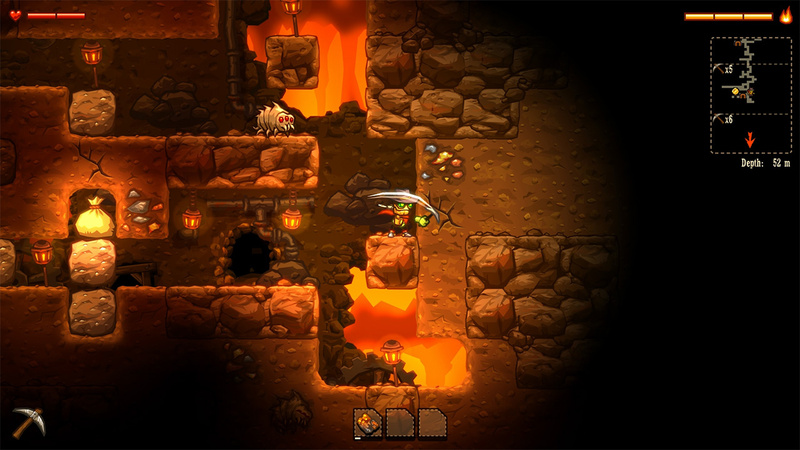 Gameplay revolves around a constant loop; you’ll head down into the mine, dig as deep as you can go, collect as many minerals and metals as you can, and then head back up to the surface to sell your goods, purchase essential upgrades and, hopefully, level up. The mining aspect puts a heavy emphasis on exploration and progression over anything else, although you will need to deal with enemies in basic combat, too. These enemies get progressively more tough to deal with as the game goes on, but the upgrades you’ll unlock will help you to shrug off even the nastiest of them without too much bother. It is actually the exploration that stands out as the toughest challenge here. If this is your first time exploring the SteamWorld universe, you’ll inevitably fall into the same rookie mistakes as everyone else. Making your way deeper and deeper into the depths of the mine seems easy at first, but you’ll need to ensure you have a route back up to the surface; if you can’t jump back up thanks to some foolish carving in the scenery, or even steam jump (which uses up your water supply to propel you further), you’ll be forced to self-destruct, losing half of your accumulated moolah in the process. With time, though, you’ll start to learn what you’re doing wrong and what things cause you to get stuck, eventually reaching a point where you’ll be exploring with almost dangerous levels of confidence. The better you become at carving perfect paths through the mine’s labyrinth of enemies and gold, the more enjoyment you’ll find yourself having; realising that you’re improving, and ultimately moving around with impeccable grace, is an incredibly satisfying feeling. Your ever-growing efficiency is also helped by the upgrades that are discoverable within the mine. The story’s plot points will guide you towards small caves that house puzzle-like sections, eventually rewarding you with some new equipment if you can reach the end. 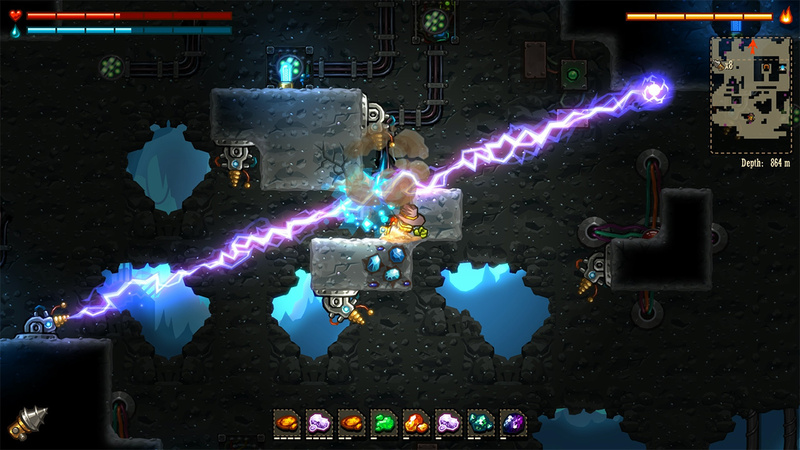 You’ll stumble across various improvements to your digging and movement skills, such as a drill and a double jump technique, that compliment the health and water improvements available from the merchants on the surface. When you’re fully equipped you’ll have turned into a quite literally well-oiled machine. The best thing about all of this, though, is how perfectly everything just ‘clicks’. Upgrades that act like new gameplay mechanics are introduced at just the right time, as are changes to your scenery. The controls feel perfectly responsive and you’ll find that map indicators always tell you which direction you need to head in so that you won’t get too lost. These pointers only suggest that you ‘should’ go in that direction, however; you are still free to explore wherever you want to go and the balance between freedom and story progression feels pretty spot on. Aesthetically, this is as strong as the original Dig has ever looked, too. Just like the Wii U version, this game, of course, consists of beautiful HD graphics and the Switch’s screen makes playing in portable just as pretty. The steampunk/western vibe looks and sounds great; character animations, and especially larger character models when they are shown, look exquisite and the colour schemes within the mine itself really shine. Of course, by being the exact same release as on 3DS and Wii U, the same (admittedly very slight) niggles we had with the game before are still present here. Mostly, this just concerns the amount of time you’ll get from the game; the campaign can be comfortably completed in little over five hours, by which point most players will be done and ready to move on to something else. You can keep exploring new areas after completion if you like, but there is little incentive without the plotline keeping you going. We’d love for there to be a little more reason to stay within the game’s gorgeous world. 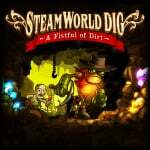 SteamWorld Dig can proudly sit amongst those top-tier eShop titles that can describe themselves as a ‘must-play’. There is a small desert’s worth of charm packed into this game, with a beautifully high level of polish and sheen just oozing from its very core. We’d love to have more reasons to play the game after its relatively short campaign and, considering this game is a short few years old now, having a UK launch price higher than when it released on previous Nintendo systems seems slightly off, but the gameplay alone will show you that this one is a real winner. If you’re looking to delve into the SteamWorld universe for the first time, this would be a great place to start. After 3DS and Wii U, time to put money on this for the third time. It's well worth it though! Brilliant game but I already own it so no urge to buy it again. My one complaint is as mentioned in the summary, it's very short. I kinda want to get this and Heist and have the complete SteamWorld collection on my Switch. But I've got both of those on PC, and I bet a Physical collection will be announced sooner or later. I couldn’t leave this game alone on the 3ds, just my kinda thing. Relaxing and exploratory but enough challenging bits to make it morish. The sound design is wonderful too. I don’t think I’ll get it on the Switch though. At least not until I’ve completed the second one. Played SWD2 just recently. Good game, but not great. A lot of cool mechanics, but few of them were fully realized. been a lot of noise about this game, most of it good. my standards for indie games are fast racing rmx and celeste, so let's see where this lands. Should I play this before the second one, or does it not really matter? @SimplyCinnamon53 If you play the second one first, it'll probably be a lot harder to come back to this one. The second one had better graphics, sound, gameplay, level design... basically everything. Which is impressive because this one was a top tier indie release. Honestly, the second one felt to me like around the quality of polish I expect from first party titles, rather than indies. The second one is the direct follow up, story-wise. You'll have spoilers for the first game if you play them out of order. But yeah, the first one is older, and you should play the GAME you want to play, it's not a movie series. If you feel like you could enjoy both, play them in order (the first one is pretty short too). But if you're not sure, or if you like what you saw in dig 2 and think you may get annoyed with the franchise if you feel like you have to play in some manner, then play the 2nd one first. I blitzed through this game in a sitting, it was awesome but also shorter than a sparrow's beak. I think I'll leave this until a physical combo with Dig, and Dig 2, and Heist, all crunched together comes out, and if that doesn't happen then I will be sad, but ultimately I'll get over it, and go on to raise many strong and beautiful children, and teach people lessons. Awesome. Awesome game... price is very fair. I played it on 3DS and actually beat it twice, which is something I almost never do with games. Going through it a second time is fun and you can choose a different upgrade path. I liked it, but it got a little stale towards the end. 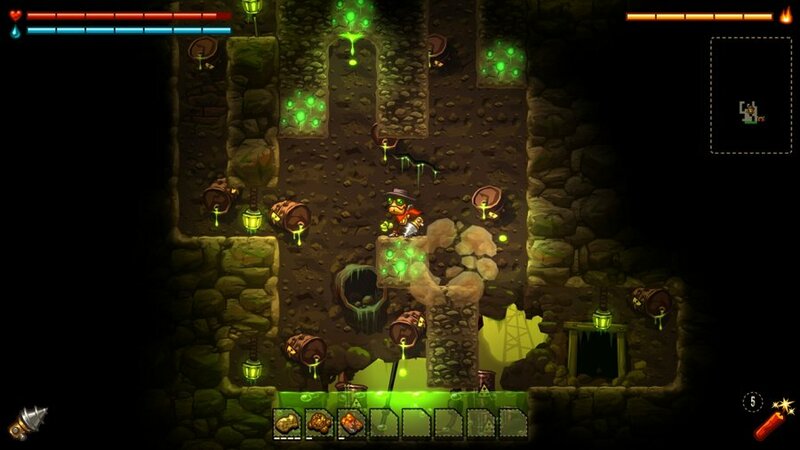 Hope Steamworld Dig 2 has some more variety, haven't played that yet. This is awesome for people who never encountered it, but as a Wii U owner, I always feel a little weird getting a game I could easily queue up on my other system. New content for Dig 2 now, please. I really enjoyed this game when I played it recently on the 3DS, so much so that I will consider double-dipping when I get a Switch. SWD2 is already on my wish list. I actually enjoy this game much better than Dig 2. For me, the shorter length is just right. Also, the digging downward gets addicting in the first game, but the second game... I just got sick of it. No doubt the second game adds interesting new elements and but I prefer the simplicity of the first. This is a good game, but the sequel really did a lot to improve upon it. In comparison the original felt like more of a basic indie game. I enjoyed Dig 2 much more, it has much better music, it generally looks and feels more polished, and there is a lot more to it. The original is a pretty simple game, so I guess like if that is your thing I can see why someone might prefer that, but I would rather play the sequel any day. @JayJ This pretty much sums up my feelings as well. I loved the original when it came out, and I binge played it through in a day - but since playing the sequel, I don't really see me ever revisiting the first. If I get the itch, it would definitely be SWD2 that I re-visit. I already have this on 3DS and double dipped for it on Wii U. Not going to triple dip. I have SteamWorld Dig 2 on Switch. And I'm going to buy SteamWorld Heist as it's the only game in the series I'm missing. If you haven't played this game though, you need to grab it on Switch ASAP. It's fantastic. 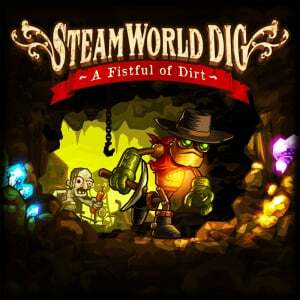 Then buy SteamWorld Dig 2. @Dr_Corndog I was surprised that I have beaten the game already when I played it haha. The last boss fight was not as tough as the one on the first game. @sketchturner I also enjoyed this game slightly more than the 2nd one. When I got the jetpack on SWD2, I was like "damn, this game is just ridiculous". In the first game, you have to mind where you dig and have to plan ahead with ladders and lamps. The 2nd one just gives you all the conveniences. As I enjoyed the second game and haven't played this OR Heist, I plan to pick both of them up later. I just don't know when. I was going to mention the same thing. Nobody seems to remember that game. @KeeperBvK Jeremy Parish interviewed the founder of Image and Form for Retronauts several weeks ago. They talked quite a bit about Steamworld Tower Defense as the "origin story" for the world and its lore. It's only $5 on the eShop right now. I think people forgot about it because it was DSiWare. @rosemo Probably also because it wasn't rated particularly highly back then. If memory serves, only nlife reviewed it and they only gave it a 5. And since it was just another TD game, nobody took notice.